Titan is perfect for anyone who is looking to tighten and lift their jowls, neck, cheeks, and forehead. It has also been FDA indicated for the temporary relief of minor joint pain associated with arthritis, temperature increase in local circulation where applied, and relaxation of muscles. Tissue tightening is not meant to replace surgical procedures such as face, eyelid, and neck lifts, but it is a good option for people who have mild-moderate changes and who understand that the results are noticeable but modest. Skin tight in a new light. Titan utilizes a safe infrared light to heat the dermis well below the skins surface. Enhance skin tone without surgery, recovery time or injections. 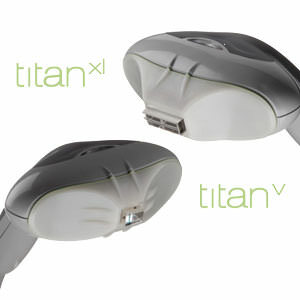 Titan is an ideal solution for your face, arms and abdomen. Tighter skin, fewer wrinkles, improved elasticity are just a few of the benefits of this revolutionary procedure. During the procedure, the skins surface (epidermis) is protected through continuous cooling with the Titan hand-piece. Most patients start seeing results by the time they leave the office. Results continue to increase over time. Patients continue to see gradual improvements over the few weeks following the first treatment. Titan treatments are lasting and gradual so you look more refreshed, skin looks firmer, and healthier.